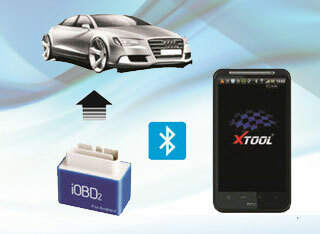 XTOOL recently released iOBD2 MINI Bluetooth Scanner; how much do you know that? Here, all useful information concerned are offered. When installing the app, please do not delete data or format memory card, otherwise it may lead to app installation failed. When the install finished, click “open” to run the app (before running the app, please set Bluetooth connection, otherwise it cannot read the data); click “complete” to exit. 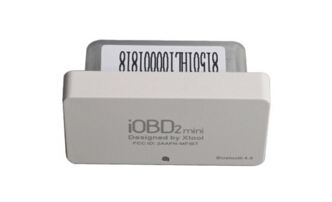 The shortcut of iOBD2 will appear on the main screen when the app installed successfully. Click to open iOBD2 and the screen will show as follows. the engine. The OBD II port is usually under the dashboard, but it may be different on different car models. 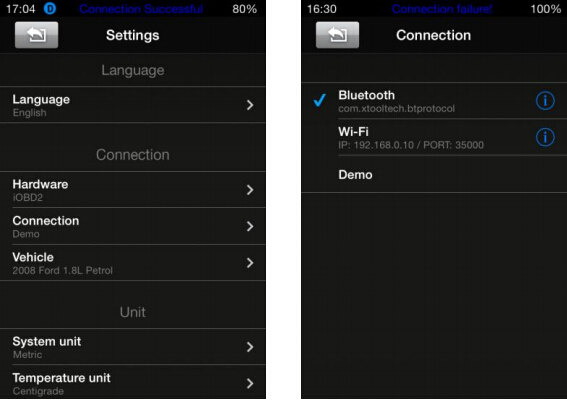 -Bluetooth connection on iOS devices: Turn on Bluetooth on the mobile. Find iOBD2 device and connect. -Bluetooth connection on Android devices: Turn on Bluetooth on the mobile. Find iOBD2 device and connect. 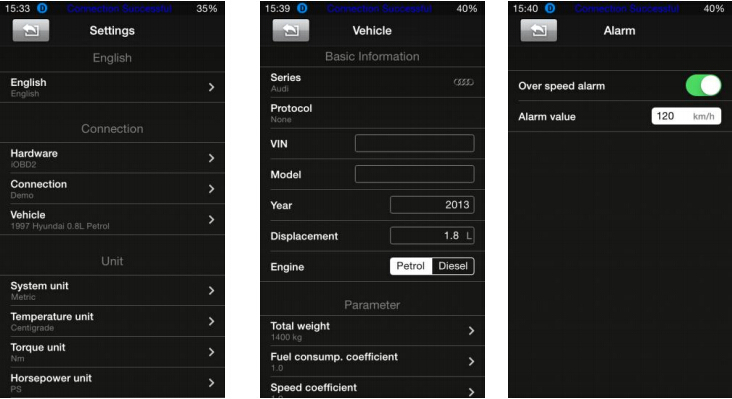 -Connection on iOS devices: When the Bluetooth is successfully connected, open the APP iOBD2 on the smart phone. Click Setting button, select Connection option. Diagnostics is not available unless the setting of hardware, connection and car information is correct. 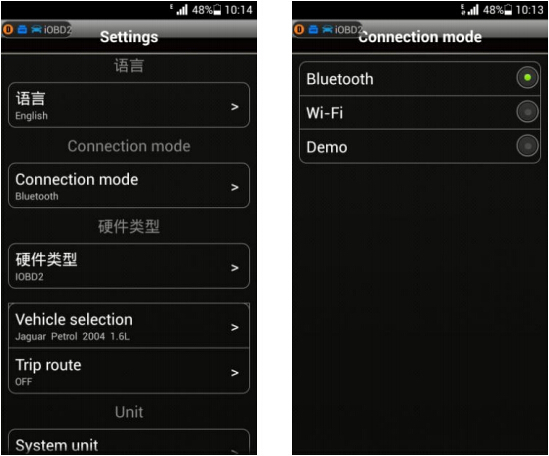 -Connection on Android devices: When the Bluetooth is successfully connected, open the APP iOBD2 on the smart phone. Click Setting button, select connection mode. Diagnostics is not available unless the setting of hardware, connection and car information is correct. 3. What might happen when first use iOBD2 scanner? 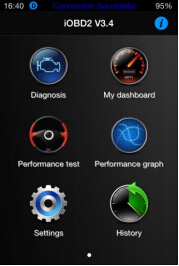 When iOBD2 is power on for the first time, if it does not communicate with the car within Waiting Time, and battery voltage is below the Limiting Voltage, it will go to sleep mode. The default waiting time is 15 minutes. This parameter can be modified. When the battery voltage is below the Limiting Voltage and within 5 minutes there is no communication between iOBD2 and the car, iOBD2 will go into sleep mode. When the battery voltage is above the Limiting Voltage, it will wake up. The default Limiting Voltage is 12.6V. This parameter can be modified. 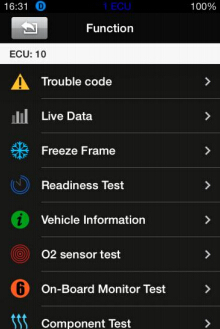 When iOBD2 is connected with the car for the first time, you can diagnose the car within 15 minutes. If there is no any diagnostic operations over 15 minutes, iOBD2 will automatically go into sleep mode. 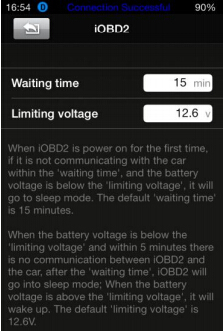 Only when the battery voltage is above the Limiting Voltage, or the actual waiting time is shorter than the setting Waiting Time, can iOBD2 wake up. This function includes the following testing items. After finish each item, click the APP interface and save the data so that you can review the history record later. [Live data]: Reads all the running parameters related to the ECU. related faults occurred. The data is called freeze frame data. 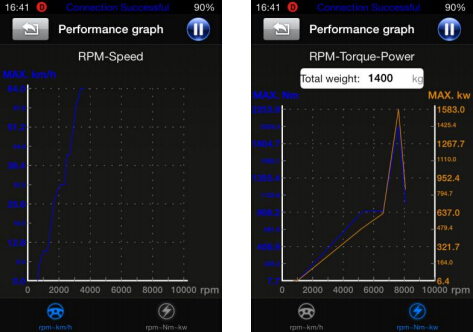 test status of the car. Supported and complete: It means the car supports this test and has completed. Supported but incomplete: It means the car supports this test but it is not yet completed. Unsupported: It means the car does not support this test. information may be obtained by the use of [Mode 6 test]. [On-board Monitor Test]: To monitor the operation of the system of external device control panel. 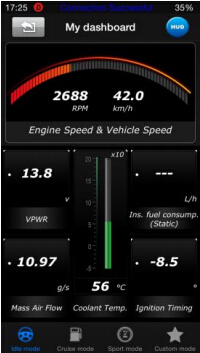 [Sport mode]: engine rotational speed, vehicle speed, water temperature etc. 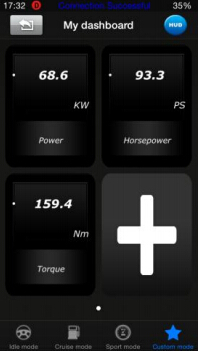 [Custom mode]: allows changing live data with preferred readings such as power, torque, horsepower, etc. 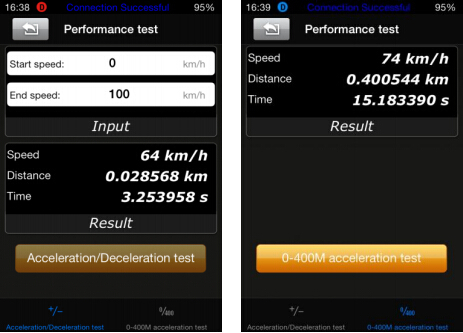 [Accelerate/Decelerate test]: Test acceleration/deceleration process time and distance. [0 to 400m acceleration test]: Test spending time from 0 to 400 meters. It is to save and review the recorded diagnostic data of the tested cars, such as live data, freeze frame data and my dashboard data. This function can track your driving route. 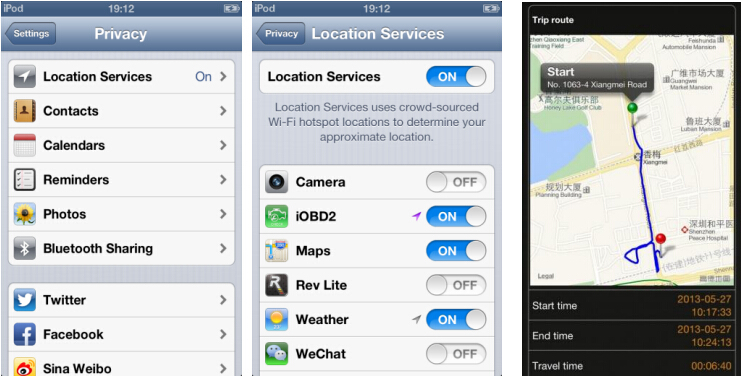 For iOS devices, select Setting on the phone, choose Privacy, Open the Location Services, and turn on iOBD2 interface. 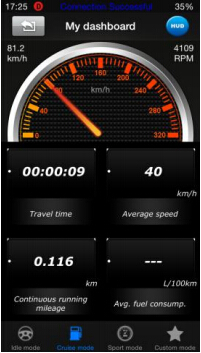 Run the iOBD2 app, choose “My dashboard”, and start driving the car, it will automatically track the driving route and save it on History menu. When exiting “My dashboard”, it will stop tracking the driving route. You can review the saved tracking route in History menu. instructions before operating.When driving the car, please do not operate this unit. Any distraction may cause anaccident. 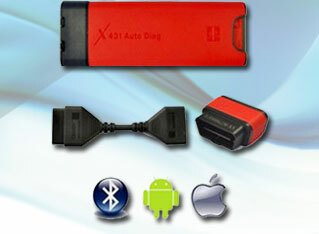 iOBD2 communicates with cars via Bluetooth. Please do not use this product in the places with strong electro-magnetic interference in order to ensure communication proper. All information on this manual is based on the latest iOBD2 version. XTOOLTECH reserves the right to make changes at any time without notice.